CANBERRA, Australia — They both wanted children. They knew it was time. Meghan had ended her acting career and moved to Britain to be a full-time royal. Prince Harry had stepped down from the military and wanted to settle down. Their marriage was a five-star glamour blowout: the spectacular Windsor Castle setting, the horse-drawn carriage on a warm spring day, the vintage Jaguar with the top down, the Hollywood A-listers mixing with real-life royalty. And now comes the very welcome word that Harry and Meghan, the duchess of Sussex, are expecting their first child in the spring. It is the perfect coda to a May wedding that sent a very clear signal that a new generation of royals is coming to the fore even as Queen Elizabeth II continues her historic reign. The royal baby would be seventh in line for the British throne — but he or she won’t automatically be a prince or princess. The highly anticipated pregnancy was announced Monday just hours after Harry and the former Meghan Markle arrived in Sydney, Australia, at the start of a demanding 16-day visit that also includes Fiji, Tonga and New Zealand. Word spread instantly: International visitors gathered outside Buckingham Palace for the Changing of the Guard ceremony felt they were partaking of royal history. It’s hard to overestimate how popular Harry and Meghan have become. The 34-year-old prince holds a special place in Britons’ hearts as one of the two children of the late Princess Diana. He had a bad boy phase — don’t even ask about the naked billiards game in a Las Vegas hotel suite — but redeemed himself with years of military service and a devotion to helping injured veterans. Harry gained even more respect last year by talking candidly about his struggle with mental health issues related to losing his mother to a car crash when he was only 12. No royal had ever publicly acknowledged this kind of frailty, and his willingness to do so in a bid to end the stigma surrounding mental illness only raised his stature with the public. Enter Meghan Markle, who represented a clean break from the royal mold. She was not British. She was an American TV actress. She was divorced, older than Harry and her mother is African-American. She captivated Britain. There was an ease to her confident smile, and contagious excitement about moving across the Atlantic and joining the royal family. Meghan, 37, is seen as a modernizing influence on the at times stodgy royal family, and she is credited by many with bringing happiness to Harry. There are parallels between her life and that of Princess Grace, another American who left a successful Hollywood career to marry Prince Rainier of Monaco and start a royal family. When Harry and Meghan got engaged, he was asked about plans for children. “You know, I think one step at a time, and hopefully we’ll start a family in the near future,” he said. Meghan has also talked about wanting to have children. 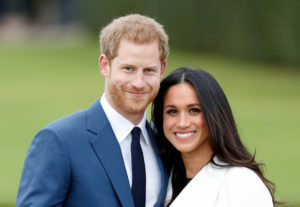 The royal couple started dating in July 2016 after they were introduced by friends, and Harry courted Meghan on a trip to Africa shortly afterward. They kept their relationship secret for several months, but word eventually leaked to the British press. Harry confirmed their relationship in November of that year, and at the same time warned the British press against what he characterized as “racial overtones” in its coverage of Meghan. He said the press had been so abusive that he worried about her and her family’s safety. It was another step in Harry’s coming-of-age. He made it clear that he loved Meghan and would protect her. Word of the pregnancy came at the very start of their first extended royal tour as a couple. It seems they withheld the announcement so as not to upstage the wedding of Princess Eugenie — Harry’s cousin — at Windsor Castle on Friday. After their arrival Monday in Sydney, Harry and Meghan held hands and walked out an airport rear entrance and into a car. Meghan, wearing skinny black pants and a black, burgundy trimmed coat, was smiling and clutching folders, while Harry gave a thumbs up to bystanders. The announcement of the pregnancy cleared up the mystery of why Meghan is not joining Harry when he climbs the Sydney Harbour Bridge on Friday to raise the flag for the Invictus Games, which he founded in 2014 to give injured military personnel and veterans the opportunity to compete in sports such as wheelchair basketball. The games open on Saturday. The baby is very unlikely to become king or queen, but will have the option of becoming an American citizen. The children and grandchildren of the queen are princes and princesses — that’s why Harry has that title — but this doesn’t apply to great-grandchildren. Same goes for the his or her royal highness designation, though the queen could choose to intervene on their behalf. Instead, the child will likely become an earl if it’s a boy or a lady if a girl. The baby is very unlikely to become king or queen, as it will be behind all of William and Kate’s children, including 5-month-old Prince Louis. And he or she is likely to get pushed still further down the line of succession as more royals are born. The child will, however, have the option of becoming an American citizen. That will be up to Harry and Meghan to decide whether to apply for a U.S. passport for the baby, who will automatically have British citizenship. Read Apr 16 Which Notre Dame treasures survived the fire?